The island of Guinea was divided 3 ways, with the west being in the hands of the Dutch, the south east in the hands of the British, and the north east in the hands of the Germans. 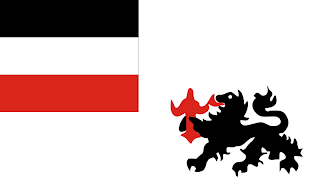 From 1899 to 1914, the Germans used a white banner with the black, white, and red tricolour in the upper hoist canton. in the fly, a lion clasping a red object. 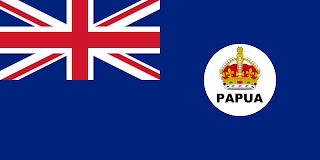 In 1904, Australia took over the governance of British New Guinea, however, because Australia was still a British controlled self-governing territory, Papua was still, legally, British. The new administration brought in a new Blue Ensign. This featuring in the fly a white circle, with a crown, and under the crown, the new name for the territory, "Papua." During WWI, Australia took control of Germany's Pacific possessions, including German Guinea.After the war, Australia was awarded a mandate to continue to govern the northern territory of New Guinea. Papua, however, remained part of the British Empire. During the bloody New Guinea Campaign during WWII, thousands of soldiers from Australia, America, and Japan lost their lives. During this time, the two territories where combined into one. A new "Papua New Guinea." After the war, the new territory was represented by the flag of Australia, until 1965, when a new green flag was introduced. Upon the green field, there was placed a gold and red Bird of Paradise. This flag was in use for 5 years, until 1970, when a new tricolour was introduced. This time, with vertical blue, yellow, and green. 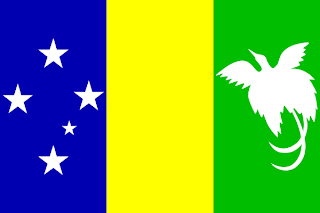 On the blue stripe, the Australian Southern Cross, and on the green, a white Bird of Paradise. That flag was only in use for 1 year, when in 1971, 15 year old Susan Huhume won a nation-wide competition to design a new flag. She designed a bicolour flag, split diagonally, upper hoist, to lower fly. The top half is red, and the bottom, black. 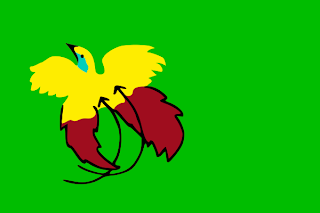 Within the red is a golden Bird of Paradise, the national animal of Papua New Guinea, and in the black, the Southern Cross as it is seen from Papua New Guinea. 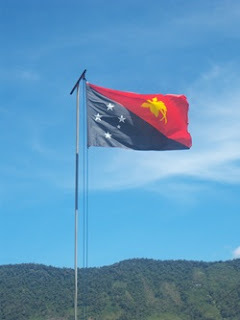 The use of red, and black, heralds from those colours use by many of the tribes within Papua New Guinea.